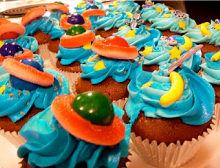 Fun ideas for an outer space themed birthday party. Space party ideas that are out of this world! Choose the ideas that fit your style and budget and then put them together for a quick and easy Space party. Make these cupcakes quick and easy by using peach rings around gumballs for Saturn, banana runts for moons and star candies on blue icing. Print out party information on rectangle labels (found at office supply stores) and stick them on Milky Way, Starburst or Mars candy bars. Black note cards with planet stickers. Black note cards with star stickers. Glue a picture of an astronaut on the front of a note card - use a picture of the birthday child's face on the astronaut cut out. Black or white cards with "Area 51 TOP SECRET" written across the front. Cover walls with black paper (or use rolls of black landscaping plastic) and draw or paint stars and planets on the paper with glow in the dark paint or chalk. Hang plastic glow in the dark stars from the ceiling. Black and blue streamers and balloons. Decorate the party table with a black table cloth and sprinkle star and/or planet shaped confetti on the table. Cover with a clear plastic table cloth. Fill small vases on the party table with rock candy lollipops and tie with ribbon. Sprinkle starburst candies on the table. Parents and party helpers can dress in black suits and sunglasses - Men in Black. Bounce House - Let party guests feel weightless with a bounce house. Foil Alien - Teams try and make the best alien from a roll or foil. Divide party guests into teams of 3 or 4. Give each team a roll of aluminum foil. Teams choose one person from their team to be the alien and then use the foil to wrap around the alien to make them look like one. Pants, shoes, shirts, antennas, face shape, hands, feet ... anything they can think of. Variation - Give each guest 1/4 of a roll of foil and let them each create their own miniature alien. Stomp Rockets - Buy several stomp rockets and let the guests see how far they can make them fly. Moon Rock Relay - Teams race to find rocks hidden in sand. Before the party fill two plastic pools with sand. In each pool hide an equal amount of small rocks. Divide guests into two teams and give each a container to hold the rocks they find. One by one each member of the team must race to the pool, find a rock and bring it back to their team's container. Set a time limit or amount of rocks that the winning team needs collect. The smaller the rocks the harder the challenge. Moon Rock Transfer - Using the small rocks collected in the Moon Rock Relay above set out 10 rocks on a paper plate. Set out another paper plate next to it and give guests a pair of chopsticks. One by one time the guests on how long it takes them to transfer the rocks from one plate to another using only the chopsticks. Moon Walk - Teams travel one by one from the start point, around a cone (or planet) and back to the start using only two pieces of paper to step on. Cut out several large moon or star shapes (8" x 8") from heavy cardstock or poster board. Divide kids into two teams. The first person from each team takes two of the shapes and lays them on the floor in front of him/her. They have to make it to the turnaround point and back by only stepping on the two shapes. They will step on one, put the other one in front of them, move the one from the back to the front and continue on. When they return to the line the next person from their team takes a turn. Variation - Team Moon Walk - Let the teams go on the moon walk together. Give them one more shape to stand on then there are people on their team. They will have to work together to move the shape from the back to the front so they can all step forward. UFO Challenge - Party guests throw a UFO (Frisbee) through different targets. Set up targets using hanging hula hoops, baskets, or string circles on the ground. Assign each target with a point value. Give each guest 5 turns to try and get the most points. If possible give each guest a different colored Frisbee - then have them take one turn at a time to see where everyone's UFO has landed.